Our certified arborists and exceptionally trained staff are experts in the skill of tree removals. 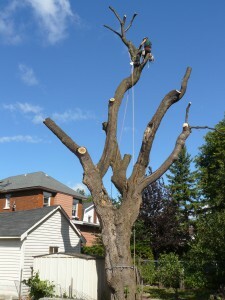 Our staff have been removing dangerous trees in a controlled manner in the Ottawa area for over eight years. We have all the necessary equipment to handle any job. Our staff are capable of roping, rigging, and lowering any limbs no matter the location of your tree. For more accessible trees, we operate a boom truck with a 60 ft reach capability. We always leave our jobs sites clean, chipping all branches and removing wood to be recycled for fire wood. Even in extreme, dangerous work environments, our team operates in an extremely safe and professional manner. We take tremendous pride in our ISA standards, methods and providing a quality service to our customers. Tree is dying or dead. Tree has become hazardous from tree topping or storm damage. Tree has become diseased or infested and there’s no alternative. Tree is causing structural damage to house, etc. Obstruction that can not be fixed by pruning. Tree is crowding and harming other trees. A more suitable tree will be planted. New construction on your property.